This 2500 square foot luxury condo has spectacular views from the 9th floor. One of the most attractive features of this unit is the large balcony for amply seating and relaxing. This condo has all the amenities for a fantastic home away from home stay in the Mexican Riviera. SOME CONDOS OFFER THE BASICS. We believe you should enjoy the benefits of all the luxuries you are used to at home, but in the paradise of Puerto Vallarta. This property and condo have left nothing out when it comes to the comforts you are accustomed to. - Added Appliances - blender, coffee maker, toaster , juicer, egg cooker, pancake griddle, bar accessories etc. - Two lighted tennis courts - Four racquets and balls in condo for your use. - Our property manager will greet you to assist you with check-in and check-out and acquaint you with all of the condos amenities. More than any hotel - more than any equivalent condo unit for rent - this is the place to stay. We trust you will enjoy your time away. Private beach for Shangri-la only. Palapas with lounge chairs available. 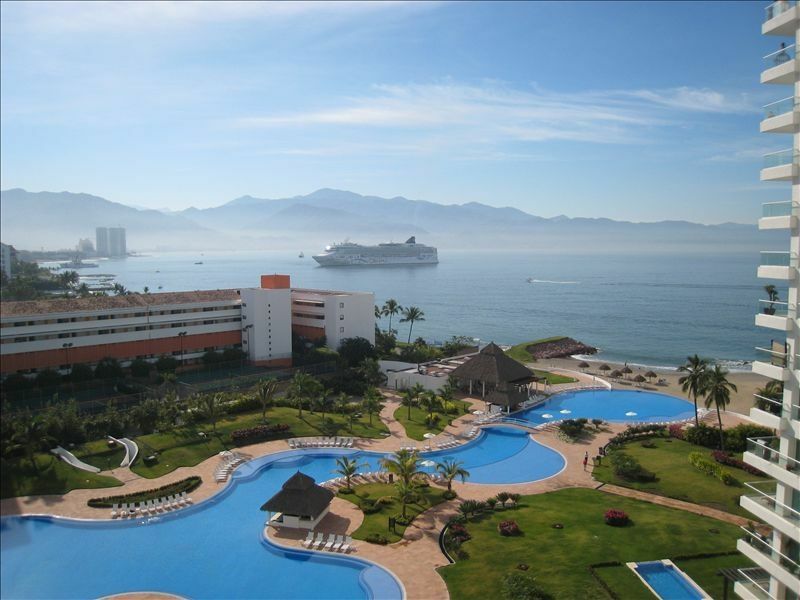 Beautiful views of the Banderas Bay and Pacific Ocean - watch the cruise ships come into port. Fantastic night views of the city lights. Individual controls in each room plus 9 ceiling fans throughout the unit and 2 dehumidifiers. One parking space provided conveniently located near lobby entrance. Granite countertops with 4 bar stools, bar accessories, wine cooler, cookware, coffee maker, small appliances. (3) Cable TV provided by TelMex (No USA channels) - 50" Smart TV in living room and 42" TVs in master & guest bedrooms. DVD players. Many outstanding options for the avid golfer, including a wide variety courses and plenty of tee times to fit your schedule. Secured grounds. Direct access to the condo via private elevator. Large infinity pool with swim up bar. Lighted tennis courts with 4 rackets and balls. Fully equipped gym with great view of the bay. Short walk to the Marina Boardwalk - shops/spa services/great food of different cuisines, Short taxi ride from airport and to downtown Puerto Vallarta. Variety of board games & cards, Championship golf course across from condo, Grocery stores nearby. Dimming lights throughout unit and balcony. Concierge service available. Spa with massage services. Poolside cafe with ocean views. Maid service avalaible for nominal fee. Tremendous apartment located in a premium complex and area. Plenty of lounge chairs available around the massive pool. Friendly staff at the restaurant/bar. Short walk to restaurants and shopping in the Marina and taxis lined up right outside to take you anywhere. I would definitely come back. Echoing what many have said in their reviews about this condo, it truly was a pleasure to stay here this past week. Not only is it comfortably furnished in the kitchen and well-equipped everywhere, it feels like home because it is tastefully decorated throughout. The elevator opening right into the unit was super convenient. No need to fuss with a key. Just use the code when you get on the elevator in the lobby. Having each bedroom and the living room as its own zone for AC made it comfortable temperature wise too. We used to stay in suites at the Marriott next door. This is so much nicer. For breakfast or lunch, the small poolside cafe on property at Shangri-La is a great choice. Not fancy, but good food with pleasant service. - If the sound system and the TVs are important to you, make sure you get a good orientation to them when you check in. When we checked in, we were told that the sound system was not working. It was only in working further with the local property manager that the 18 speaker multi-zone sound system was finally available to us a couple days later. - We chose this unit for the 2 ocean facing suites. There were only 3 of us, so we did not even use the 3rd bedroom. Now that we’ve seen the 3rd bedroom, if more than 3 of us were to come, we know it is really just for sleeping. It is a bit smaller than the 2nd bedroom, and is separate from the unit (across the hall). The 3rd bedroom does have TV with DVR and its own wifi connection. Thank you Leona for making your home available for such a pleasant stay. And thanks to Miguel and Walter, the local property management reps for their help with check-in, checkout and the sound system. We’re already thinking about our next trip! We were a family of four travelling to PV for our first time. The location of the condo is fantastic right on the beach with the best pool! The kids lived in the pool. The condo was fantastic with a quick walk to the marina which had many many restaurants and shops. The security at the hotel was great. I would recommend this condo again, great kitchen with all items needed. The pool was wonderful with a great little restaurant and bar - fantastic for a snack, breakfast, lunch or an early dinner. Also the work out room was clean well stocked and had a great view of the water. We are glad you enjoyed your stay and look forward to having you back soon! Thank you, we look forward to your next stay at our condo! Our family had the best time ever!! Beautiful condo with everything you need. Pool is fabulous and everyone that works there is friendly and nice. We WILL be back! Thank you so much for your comments regarding your stay at our condo! I am so glad you and your family enjoyed your stay and hope you will keep us in mind for future accommodations when visiting Puerto Vallarta. The condo is located in Marina Vallarta - This walkable community is packed with sidewalk cafes, alluring shops, wellness centers, art galleries, coffee houses, and just about any cuisine you can imagine, all situated around rows of sleepy yachts at rest. Email for Holiday Rate Quotes.